Palm Coast government–and Palm Coast taxpayers–may soon face a reckoning. Demands for services keep rising faster than tax revenue. Tax revenue set to fall substantially in 2019, if voters approve an additional homestead exemption. A city council discussion of Palm Coast’s budget on Tuesday focused on those coming contradictions, which may require substantial changes in the city’s tax and fee structure. The needs are many and varied: the city’s stormwater infrastructure is decaying and requires big and costly upgrades. The city’s stormwater fee can’t cover the needed work. An additional homestead exemption would initially lower general government revenue. The city will have to make up that revenue either by raising the property tax or by starting new fees, such as an electric or water public service tax of up to 10 percent, which would inevitably be passed on to rate-payers. The council nearly went that route in 2012. Crushing public opposition forced it to reverse course. The city is also looking to rebuild private seawalls in canal zones (the city compares sea walls to private driveways), but that cost would be paid by residents there in a special taxing district. What was dubbed as a simple budget discussion focused on the city’s revenue sources Tuesday turned into a much more consequential discussion of what’s ahead. The sum total of that discussion is that the current tax structure in the city is no longer tenable without changes residents and businesses will feel directly. The specifics are unclear. The principles, setting the city on a new course to be defined in coming months, aren’t: the administration is working on those proposals. Politically, such a discussion–and any resulting proposals–would have been unthinkable in an election year. But the council is in a fortunate position. Its two open seats are not being contested by their incumbents: Steven Nobile has already resigned, his appointed replacement is not running in the election, and Heidi Shipley, who occupies the other seat, has opted not to run again. That gives the council a relatively free hand to conduct its business shielded from the pressures and influence, on some of its members, of an election year. It may also explain the boldness of Tuesday’s discussions, which took on previously taboo subjects with fewer concerns over fallout. In fact property taxes account for only 13 percent of total city revenue, but that’s taking into account the city’s stormwater and utility services (water and sewer), and impact fees (parks, fire, transportation, water and sewer), which account for nearly half of all revenue. But none of those sources feed into the general fund as property tax revenue does. The general fund pays for police and fire and other vital services. A looming reduction in revenue may open the way to new sources of tax or fee dollars. Mayor Milissa Holland, who’s been taking a distinctly more assertive role on the council in the past few months, is concerned about infrastructure. “We are running a very significant deficit in our stormwater fund,” she said. The stormwater fund is not actually in deficit: it ended 2017 with a fund balance of $21.7 million. Holland clarified in a text that she was referring to a disparity between what the city wants to fix and the money it has to fix it: the current budget has revenue and expenditures from the stormwater management fund matching at $8.7 million, though the stormwater utility fee generates about $7.2 million of that. Revenue is up from $5.1 million in 2015. “This is a really critical need in our community and probably is one of our major responsibilities,” Holland said. The stormwater fee was created in 2004 to pay for drainage management and improvement in a city where, without such infrastructure, flooding would be a recurring problem. The last stormwater fee increase dates back to 2013. It went up by 46 percent. Two years ago the city manager signaled that more revenue would be needed, but the council didn’t budge. In other words, a greater price tag to rate-payers is almost certain. This even though property tax revenue, which had fallen by 25 percent after the Great Recession, has recovered its loss and returned to over $20 million for the first time in 10 years. But Palm Coast, like every local government, is facing a potentially serious setback to its revenue structure come next year: voters will be asked on November’s ballot whether they want to increase the homestead exemption to $75,000, from $50,000. The homestead exemption means that the sum is deducted from a property’s taxable value, providing a substantial tax break. So if a house has an assessed value of $175,000, it will pay taxes on only $125,000 of that. If the additional exemption goes in, it would pay taxes on just $100,000. The additional exemption is expected to win voters’ approval. Should it pass, it’ll put local governments in a bind because it will reduce tax revenue considerably. 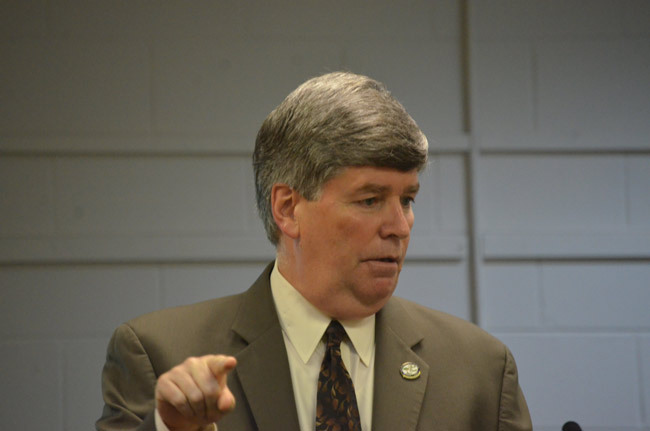 Most governments, say officials in county and city governments here, as well as Property Appraiser Jay Gardner, will simply shift the tax burden and adjust tax rates or come up with new fees to make up the difference. The Palm Coast council talked about just such options. “The exemptions, they cut the tax values, in order to keep the same revenue, the tax rate goes up, we’re going to see that come up right here in a couple of years if voters approve the exemption,” Landon said. There are caveats: Only $25,000 of the exemption applies to school taxes. And the proposed additional $25,000 exemption would apply only to homes valued at $100,000 or more, in essence providing a tax break to wealthier people, at the expense of less affluent ones–especially if governments raise their tax rates to account for the loss: people in the protected bracket will be more shielded than those at the lower end of the scale. One of the ways to pay for lost revenue is through a new public service tax–the sort of tax cities such as Ormond Beach, Daytona Beach, DeLand, Flagler Beach and Bunnell all impose on FPL, all of whom impose a 10 percent tax, and which gets passed down to customers, raising millions in new revenue. Such taxes are considered regressive since they affect lower-income residents more than wealthier ones. Council members from time to time, and Holland particularly right now, get frustrated over residents’ misconceptions about the city budget. Frequently, residents confuse one pot with another. They think the city council has authority over teacher salaries, or confuse county and city taxes, sometimes local, state and federal taxes. In the end, it’s all taxpayer dollars, but city officials may pay the political price of, say, county or school taxes over which they have no authority. Holland asked that the city devote more attention to educating taxpayers about the differences, possibly in one of its monthly lunch-and-learn sessions. I do not mind paying a higher tax if it is for the schools, however, why should the residence be responsible for the frivolous spending of the Council on such things as bathrooms, lighting for a soccer field but not the residence, shade sails over playgrounds, a new youth center that is literally not accessible by foot along with many other projects that were ill thought, ill planned and not approved by the residence. Get rid of them all and start anew with clear thinkers who support the residence, not themselves. How about coming up with ways to save money instead of planning on how to bilk the taxpayer first. Give us some PPs (Power Points) on saving instead of spending. Earn your wages or expect to be dumped! Okay, let’s start by having all those in Palm Coast government making six figures take a pay cut. Stop extraneous, wasteful spending, and 70% of the money problems will be solved. Local governments are always a mess and have the most egregious use of funds because the people elected win a popularity contest. Nope, don’t even think about it. NO NEW TAXES. November is coming you tax vampires. Your not sucking us clean anymore. We don’t want your flowers on the streets. We don’t want Coffey pocketing anymore of our money. ITS OVER !!!! Put tax liabilities on business who in turn collects the tax from his pard me her customers. It is time, perhaps overdue to have municipalities, counties, Stztes and the U.S. to disclose the true revenue streem on the internet. Is this because palm coast is a deed restricted community? Maybe we should allow more businesses in and will attract more families here. Staley is spending like a drunken sailor! Wal-Mart just dumped their high paying employees this year and reorganized. Some employees got relocated within the store and they cut their pay. Others were gone. Follow their example Palm Coast and look at your employees and reorganized. The city and county have most of the high paying jobs. It’s time for a change. This is Florida not the north. You don’t need tons of money to survive. How about looking at spending!!!! For instance public works where every project has 10 men on it? Or medians that don’t require constant maintenance! How about going into city hall and looking at EVERY position. Do we really need a chief, deputy chief, 3 battalion chiefs, 3, captains and 8 lieutenants in a town with no fires? Is every department running as efficiently as it should? And Landon’s salary???? You cut out all the waste in this town and after that I will accept any increase in my taxes you need,, fair enough?? Holland is proving to be a disaster for the taxpayers. Ditto the new City Council. The animosity towards renters in this town never stops amazing me. Renters most often pay your precious tax in the form of over inflated rent. Don’t think that Land Lords or management companies don’t find a way to recoup property taxes. I rent because my credit is not where it needs to be to get decent financing. Doesn’t make me a bad person. Should someone remind the council this is PALM COAST, not millionaire’s row in South Florida? But I DO like flowers on the side of the road…I also like fire trucks and parks. Why do people hate quality of life so much? Quite wining so much or move out of the city limits. There is not one even semi-positive post on this page. Palm Coast is a beautiful city to live in and most would start griping if the amenities were scaled back. You get what you pay for and that extends to management. You grip about Landon constantly but remember he saw this funding problem coming years ago. It’s management that sits on their arse and waits for the worst to come before acting that you have to worry about. None of them are as over paid as you naysayer constantly claim. They are not serving up burgers, they are make complex decisions (that most here think are as simple as deciding what to have for dinner) and investing your our tax dollars into a city that will hopefully thrive instead of decline like so many other are these days. Just what did you Keep It Like It Is folks think was going to happen without business development to absorb some of the tax obligation. Restaurants and retail establishments where you can spend your money won’t do it. I have heard that phrase, I Want To Keep It Like It Is, many times before. The cost of city services will never be fully subsidized by real estate taxes. Home building is the barometer that so many measure growth by. Please put a bid in on this bridge I have to sell, I will make sure yours qualifies as the lowest. And I guess, you, the masses, are just tickled that you have a golf course and a tennis court to boast about as an amenity. An amenity for a selected few. Tighten the proverbial city belt and get rid of both. And please don’t declare that you want your own police force. Whoever sold the voters on becoming a city sold them a snow job. The payscale for the top echelon of city workers is very much out of sync with the median income of the city. Unfortunately, as long as people have bike and jogging paths, golf and tennis and can play sports on the many ball fields they will be satisfied. Just feed them cake. 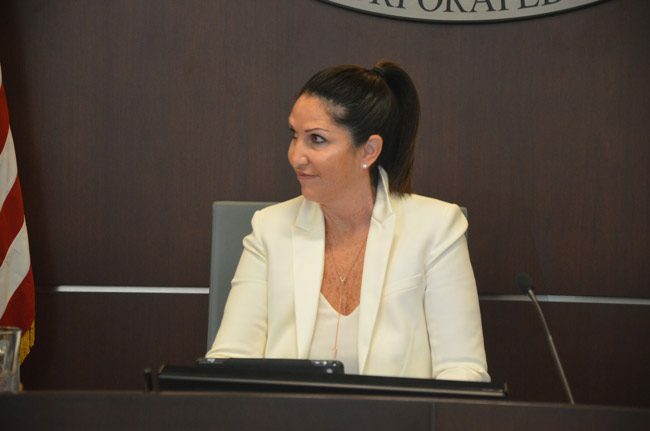 Voter’s should have known better than voting Melissa Holland into pubic office for the city of Palm Coast…..now you are going to reap what you sowed…..this woman is unemployable, never has really ever held a job and is not qualified to be a Mayor or hold any elected position! When the taxes go so high that you can’t afford to pay them you will start doing your homework and stop voting for those like Cuff, Netts, Landon, Holland, Klufus…just sayin. This city of Palm Coast needs a forensic audit!!! If the council and mayor don’t vote for it, put it on the ballot! Stop giving away incentives to developers and charge them impact fee’s accordingly instead of passing along the costs to taxpayers. If a developer cannot afford to build without impact fee’s then we do not need them nor should we subsidize their profits. Recent articles by the Mayor indicated more progress ?? by providing incentives, this is just another political move to shift the tax burdens to residents. Citizens need to revolt against politicians that ignore impact fee’s. Take a look at how Sandy Springs, GA is run. That’s what PC needs. Cut spending, attract new tax paying business that bring good paying jobs, and beautify PC. Amazed that the expenses increased so much! Where is the analysis of the past 5 years budgeted vs actual expenses? What about shared services with other towns? Pathetic, but no surprise. No one on the Council has any real experience….neither does Landon. Why do we need to piss away hundreds of thousands on landscaping they are overwhelmed with !!!!! As I had stated earlier in a previous Flaglerlive article about increasing the Homestead Exemption to $75,000, I believe that this increase would better serve the senior population who are on a fixed income versus everyone who have houses assessed for more than $100,000. People who are still employed and earning a decent salary have the ability to absorb any tax increase whereas seniors do not. Palm Coast – the wannabee big city. Give away the farm to attract more businesses and building, then realize that the ‘farm’ they gave away was what WOULD have help pay for the increased costs of attracting more businesses and more building. Drop impact fees to give builders ‘incentives’ to build – utilizing MORE of the infrastructure that they don’t have to contribute paying towards, then complain that the infrastructure is failing. Didn’t our Mayor just recently come out in favor of a new 1000+-residential development? If Palm Coast can’t support what they have, why add more? Progress, progress, and more progress – all riding on the backs of those residents who came here looking for a quiet retirement community. If Pam Coast thinks they can become a ‘big city’ with all the benefits of such, then they best realize that they are ALSO going to get the negatives of being a ‘big city’. Can’t have one without the other. @those posters yelling about ”vote them out’. Well, read the article – the reason this is coming up now is that the council has NO fears in the upcoming elections. @those posters mentioning savings and reductions – I concur and agree. If you notice the news – local, statewide, and national – you’ll see that ALL the government structures are looking to INCREASE revenue – but NEVER mention reducing expenditures. It’s the nature of a bureaucracy to try to grow and defend itself – usually by eating its constituency. If Landon saw it years ago why didn’t he take the bull by the horns and do something about it like he does for everything else? He is rewarded quite well for his supposed skills he should have been on top of this, don’t you think? Maybe we should do a better job picking our managers. Maybe we should do a better job picking our leaders who hire the managers. Maybe you should move out of the city limits so you are not offended by Palm Coast residents whining. Maybe, maybe, maybe………. CUT SPENDING! Mayor Holland how about getting rid of Jim Landon and that should allow the taxpayers to have a break from Landons over priced salary and perks Netts so freely gave him. I absolutely love the note that our incumbent politicos will not have to worry about voter backlash ofor additional taxes & fees because they are not up for reelection this year. How convenient. I how much additional pork will benefit from any new fees & taxes blamed on the homestead exemption. Another question that begs clarification is, doesn’t the homestead exemption increase also applicable to Flagler County residents outside of the City of Palm Coast? Why are we only hearing about the city of Palm Coast? On the other side, several comments call for reductions in council members pay to cover the shortfall. If all of them had their pay cut by 100%, the total savings would not cover even a small fraction of the claimed shortfall created by the increased homestead exemption. Are they being paid far too much for what they actually do from the perspective of average city dwellers; most definitely. Lastly, no one likes to pay additional taxes or “Fees”, as if changing the name to one less offensive would make payers more amiable to pay. But shouldn’t the costs of individual services be paid by taxes or fees leveled for THAT purpose? Why are we hearing that we must pay additional taxes & fee to cover needed storm water improvements when that particular budget ended 2017 with a $21 million surplus? That is NOT honesty or physical responsibility on the part of our county elected officials. How about starting with zero base budgeting? Have every department justify every penny of their funding. Maybe rent out some space in our lavish city hall? I agree to cut some of the benefits for the overpaid mayor and council members. I bet they have no problem keeping the lights on or putting food on the table in their own homes. But soooo quick to raise the little man’s taxes to cover the spending tbey want. Heaven forbid one of them has to drive by a median without brand new plants and mulch. Once some of them gets to even experience a bit of real life most of us Renters deal with on a daily basis while trying hard to better our families we will consider higher taxes. I just dont understand why these things arent imposed on people who can truly afford them. My husband builds new huge houses everyday destroying his body for spoiled people who could care less. But someones got to pay the bills right. Nate has to go! He has raised taxes every year! Is Palm Coast so bad? Only about 22% of our tax bill goes to Palm Coast. We are one of the very few cities that do not have 10% utility taxes. The city tax is very comparable to similar sized cities in Florida. The city is talking about the need to offset the tax loss if the homestead exemption is increased. (an exemption which doesn’t really help, it just moves the burden around) Also consider what city council people are paid compared to county commissioners and school board members. Most people appreciate the way the city is kept. If the city council decided to let it all go, there would be a lot more complaining than what we see here. What in the hell is going on? Are the mayor and city council wearing “rose colored” glasses? Worse, what are they smoking? On the one hand they say we don’t have any debt. On the other hand, my research shows 17 million in debt service…this debt must be paid to the bank! This is unconscionable! It reeks of extremely poor fiscal management that is continuous year after year in this city. When I was on active duty in the Marine Corps, I had to account for every penny in my portion of the budget. I had to stay within the budget and obligate 100% by the end of the fiscal year. If I expended over my budget, that was the end of my career with possible jail time. No excuses tolerated. The one fear that we should be worried about is that this taxing is going to happen as there is nobody except Heidi that will vote against it. We are helpless as a community unless we call the city council members with such outrage and anger that two may flip on this decision. We need to blow up their emails and phones with our calls 7/24! Let’s not forget, we can also begin a recall campaign if we have to. You know, as we approach the 4th of July and celebration of our and freedoms, I am reminded of one of the tenets that raised the ire of our forefathers was “no taxation without representation”. While we have elected officials as our representatives, they don’t listen to the will of the people! In essence, we have no representation on this issue. The last time I checked the dictionary, I found that the words of accountability and responsibility were still maintained despite the fact that Palm Coast politicians have no concept of their meaning much less how to spell them. As a matter of fact, our Palm Coast council members and mayor are not concerned about the upcoming elections this year. They will worry about their reelection next year and hope that the voter’s forget about what they did to us this year with taxes and other unsavory acts. I, for one, demand that the city conducts a forensic audit. I want the full justification for the expenses incurred by the city. If the city council does not vote for a forensic audit, then they most be hiding questionable expenditures. Or, maybe they “can’t handle the truth”! All these complaints, all these suggestion wow- all are falling on deaf ears. The higher ups know and expects this and know that our citizens will forget what they are saying and they will do what they want which usually is of benefits for the higher ups. Remember all the complaints regarding landon’s raise? What happened? Nothing! Even our mayor didn’ Balk at his raise and retirement package – as well as the newly elected council members. The Three Puppets: Winkin’, Blinkin’, and Nod are going to educate the taxpayers about taxes?! Really!!?? This is the same group who, when presented with a golden opportunity to save taxpayer dollars by vanquishing Landon, chose instead to equip him with a golden parachute, courtesy of the taxpayers. This is the same trio who failed to read and abide by the terms of the City Charter. These puppets are also supporting the Munchkin from Georgia in his bid for County Commission. Birds of a feather, rather, snakes slither together. Now this group, instead of requiring an immediate review from all departments, which should culminate in recommendations to cut each department budget by a percentage certain, plans to educate us, the taxpayers, in order to make bending over a bit more tolerable. How’s that dream team working? CUT SPENDING, CUT SPENDING !!! Mayor Holland, why can’t you stand up to Landon and get him out of here, his salary and benefits are off the charts thanks to your buddy Netts. So, now us taxpayers have to get the worse of the cities mistakes on handling our money. We want this on a ballot and vote to get Landon out of here and have more of a say on what you are doing to this city. Mr. Howell please become a council member and straightened this city out. They are careless with our taxpayers money and now they want us to fixed their mistakes by charging us more. What about all the strip malls they keep allowing to be built with empty store fronts all over town. If I were in office I would be so ashamed for out of town guest to see that. Netts had to have his new city hall, more waste of money and not lets forget how Netts had to have new trees and flowers planted everywhere, and some good flowers torn out with new ones put in. Netts and now Holland who must be taking orders from Netts are crying poor and need more of our money. STOP. I can’t wait for the next election. I completely agree with you Jack. This city needs a forensic audit and if the council won’t call for one, we voters need to get it on the ballot!! This is why the previous city financial director bailed and why Landon has chose to retire…..he is just riding it out and getting what he can before he goes so he can keep his thumb on the pulse to know how far to run. How can we get a forensic audit started????? Just about now city is broke …but 8 million for overpriced community center, another 5 or 8 million for public works building, reserves from the utility to widen then Old Kings Road to the tune of 9 millions to enhance good old boy Town Center access and also the millionaire infrastructure of Boulder Rock and Rte 100…also a given to Town Center, and our 5 million never returned yet for the Town Center CRA…Parcels bought adjacent to TC off Boulder Rock with our hard earned tax millions for giveaway cheap to TC developers, like the Wawa location, 2 parcels we paid 1.3 million given to Unicorn Developer in Orlando for $800,000 to build Wawa..Excuse we will recover in generated taxes…wonder when. Now millions to destroy and remodel currently beautiful White View Parkway…meanwhile in Old Palm Coast we drown and slid and slide with every rain cause ain’t no funds for this expensive undertake. Also they invest over 30 millions of the city reserves and in 12 months the bad investments show a bleeding of almost 4 plus millions in their principal invested…and they applauded the corporate financial advisor live on the meeting. This investment charade during a Trump year were all horns are lauding a great economy!! No one really watches, no one goes to the meetings. Maybe because in the workshop meetings, we have to endure Landon and Reischmann giving us their backs to the very idiots that pay their incomes. Never mind that they also give their backs to their own city department heads! Turn around and face us! Please vote these idiot’s out . Netts move back to NJ please. Were not a sleepy little town anymore. I see this as a yearly concurrance. I thought the city council members make the hefty sum of $8000.00 a year. Someone (Pierre) correct me if I’m wrong. That’s EIGHT (8) thousand. (not 80). And some of you are screaming for them to take a pay cut???? Ms Holland please take your foot off the accerator. Bad road ahead!! How much will it cost to make WhiteView a two lane? That makes sense. They have other jobs. Their work for the city is a part time gig. Oh shate. Our city council smells a strong economy. Maybe they will raise taxes on the industries. Oh wait – we don’t have any. Do you know what they call the city council of a city with no industry? Ok. Here is the deal. You can raise taxes but eliminate the city manager position, eliminate all tolls at the 2$ bridge and eliminate all barriers on public access roads (are you listening Grand Haven?). There already is a “renter tax” as such property’s are taxed at FULL value. They do not get any homestead exemptions so in effect renters pay MORE in “property tax” then those who live in a similar home and own it. JUST what “Demands for services keep rising faster than tax revenue.” are we asking for??? I believe most of us ask for a local Government that does not SEEM to exist for its own benefit and those at the top within it. As I told the former mayor, before the election of Melissa Holland, why are residents being asked to pay the bulk of infrastructure costs. Why aren’t developers building shopping center, businesses, mulyiunit housing developments, etc providing a good deal of the infrastructure costs as a requirement for considering their proposals. After all, they will greatly increase traffic, water and sewer demands as well as storm water requirements. This needs to be done to shield the residents from having to pay more than they should be paying. This certainly makes me feel even better about my new home purchase in Bunnell that is only a 1/2 mile from the Palm Coast Target. @Sam, do you honestly don’t think that the owners of rental property don’t considered the taxes on the property when setting the rental cost? Renters pay tax, even tho it isn’t labeled such.